These educational resources will be a great way to inspire your class and get the best out of your experience. The foundations will be laid for the school excursion as students get the unique opportunity to meet aquatic creatures and have close encounters with first hand interaction. Most importantly, the excursion is very educational. The students will enjoy a fully guided tour with education opportunities the entire way through. Any particular topic that you are teaching at school can be incorporated (just pre organise with the guide), otherwise the staff will plan the tour for you. Irukandji Shark & Ray Encounters is an essential and exciting experience that awaits everybody! Students of any age can join in, feed, pat and learn about the most amazing creatures. Guests will be safe, standing in waist deep water or less, and no one will ever forget the opportunity to feed sharks and rays. This is the only aquarium in the world dedicated to providing shark and ray feeding experiences. Interacting with these large, friendly creatures is exciting, challenging, empowering and educational. Sharks and Rays evoke fear about monsters of the deep, yet in reality, they are gentle creatures with amazing personalities. As students enter their world they can develop a new appreciation of these animals and the importance of our ocean systems. We want you to have a positive, engaging experience interacting with our marine life. These lesson plans will positively engage your students during your fully guided visit to Irukandji. Download these educational colouring and learning sheets for your students. Each sheet contains educational information. Inspire your students by making changes in your own classroom. From recycling stations, building a community garden or calculating your carbon footprint, you’ll find many ideas here. 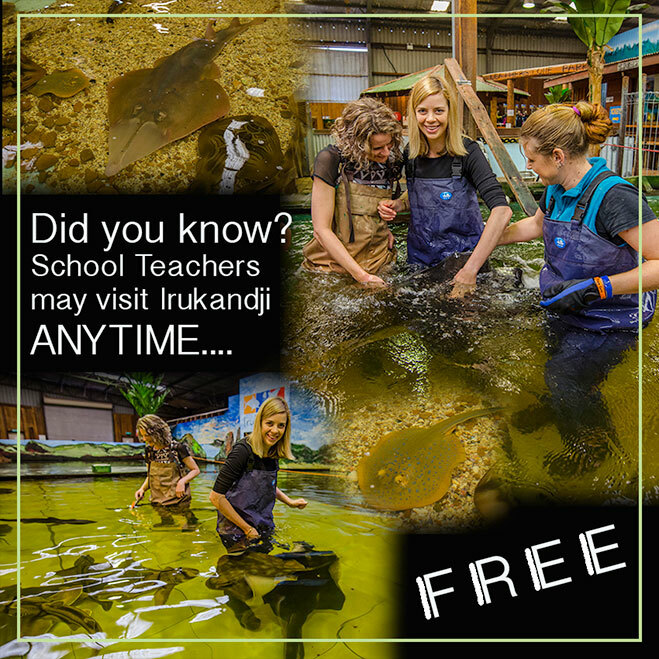 School teachers may visit Irukandji at any time for FREE! This special limited offer for our esteemed educators aims to promote the all-new Irukandji Shark & Ray Encounters and its exceptional educational programs for all ages. Once the entering teacher has supplied their New South Wales Teachers Federation Card (or equivalent) they are entitled to one FREE adult entry AND FREE Shark Encounter valued at $44.50!